KANSAS CITY— This spring, Hallmark is once again proving the relevance of its brand and the greeting card category by launching new card collections targeting younger shoppers, more innovative 3-D pop up cards, and all-new premium influencer collaborations. Later this season, Hallmark will introduce an all-new card line called Good Mail. Intended to put a little more good into the world, Good Mail cards are created by diverse artists featuring a variety of styles and voices to reflect today’s relationships with real takes on life. The majority of the cards in the line are not tied to birthdays or a specific holiday, making them easier for consumers to send to their circle when they want to let someone know they care. Good Mail also supports the younger consumer’s desire to buy products that are made responsibly – the cards are created and manufactured right in the heart of the U.S. in the Kansas City, Mo. area. Also coming to market later this spring are two new collections within Hallmark Mahogany and Hallmark Vida. Uplifted is a celebration of black women and how they connect with one another in ways that are unique to black culture. The collection is about female empowerment. Its bold designs and empowering editorial are the ideal vehicle for women to uplift each other every day. Love Ya Mucho is a new collection of English cards with Spanish words and/or design elements that hold strong cultural meaning. Casual and contemporary designs mixed with positive, conversational and simply stated messages make these cards ideal for consumers who flow seamlessly between English and Spanish, or who speak predominantly English but connect deeply with their Latino culture and lifestyle. Hallmark’s newest innovation, Paper Wonder, continues to see success with consumers. 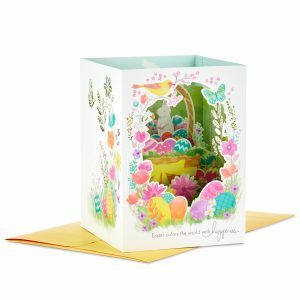 Shoppers will find new designs for everyday occasions and upcoming holidays, such as Easter with a three-card collection that features intricate illustrations and laser-cut layers that create a complete pop-up scene that can be displayed and enjoyed through the season. For Mother’s Day, consumers can shop a 19-card collection of Paper Wonder cards that includes new pop-up bouquets. With charming painterly scenes that unfold across overlays of texture, detailed die-cuts and natural edges, each card opens up a world of wonder for moms this holiday. Consumers will also find Paper Wonder in the gift wrap section featuring gift bags with intricate paper details to complete their gift. New Paper Wonder designs are also available for Graduation and Father’s Day with a four-card collection for each featuring icons and imagery that represent grad and dad. Paper Wonder cards for new grads celebrate their accomplishments and Paper Wonder for dad recognizes all that he does for the family through pop-up scenes that can be displayed. Hallmark is also introducing new two new Signature designer collaborations. Cards co-created by Hallmark artists and Jamel Saliba, the fashion illustrator behind the popular Melsy’s Illustrations. Each beautiful design features feminine, dainty, hand-drawn illustrations. And calligrapher Laura Hooper partnered with the Signature team to co-create a collection featuring gorgeous hand-lettered greeting cards. The designs showcase the elegance of calligraphy, with a modern, approachable twist.